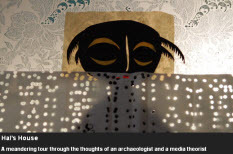 Hal's House takes a meandering tour through the thoughts of an archaeologist and a media theorist to explore the relations between technology and art in human societies through time. Jumping from prehistoric timescales to the contemporary day, Hal, a research subject stuck in a smart home, is smothered by exchanges with his computational house helper who seems to know about art, feelings, and thoughts. What the house does with this information - surveil and sell it or scratch it from the server - is unclear. The film is based on a short fictional story by Dr. Sarah J Kember, Professor of Media and Communications, Goldsmiths College, University of London. Re-printed below, is a local newspaper report about a lightning strike in Florida. The actual photograph has been removed, for reasons that will be made clear in my own account of what the image shows, and what happened to it as it began to circulate to a wider online audience. You may have seen the image yourself. You may even have contributed to its own metamorphosis. If you are one of a number of people who believe that what it shows is a moment of change, of transformation which is normally invisible to the human eye and fatal to the individual, then what follows is proof – scientific and non-scientific – that you are mistaken, and at the same time, correct. Media, Mars and Metamorphosis is the title of a remarkable open access e-book by Jeremy Hoyle. Hoyle is a former student, and at times zealous disciple of Francis Fukuyama (Wikipedia). His work echoes and extends the concerns Fukuyama expressed in Our Posthuman Future; for the status of human nature in the era of biotechnology, and for the rights of the individual in a threatened liberal democracy.1 Like Fukuyama, Hoyle considers himself to be a social philosopher, and he too is something of a populist. He has sought out three of the most recent and controversial experiments in biotechnology in order to dramatise his concerns, and each promises (or threatens) to change the meaning of human life. He has chosen open access publishing because, as Gary Hall points out (in Digitize This Book! ), it has the potential to reach a very wide audience while garnering feedback and creating a market for a subsequent paper publication: ‘the main priority of most academics is to have their research read by as many people as possible, in the hope, not only of receiving greater levels of feedback and recognition for their work, and thus an enhanced reputation, but also of having the biggest possible impact on future research, and perhaps even society’ (2008: 46) . However, the impact of Hoyle’s first draft was not quite what he had hoped for, and indeed, expected. Of the three people he interviewed in connection with the experiments, two are currently suing him for defamation of character, and the third is still consulting her lawyer. On the advice of his lawyer, Hoyle has temporarily withdrawn the manuscript and its associated links – including a podcast, blog and short film on YouTube – from the web. Although he has sought to remove all evidence of his book, and although it was only posted for a brief period, I was able to read it, and can offer the summary that follows.